Today was a free day for me, at home in the country. My intention was to have a gentle time, walk the dog , do my exercises, add some final touches to my new meditation studio and indulge in a little relaxation. But clearly, the day had ideas of its own and made me focus and draw on the life tools that I try and live by. I will share it with you but first some thoughts that helped me through the day. I find the fact that our whole experience of life is powered by the clusters of neural pathways in our brains, some hard wired for our survival many moons ago and not always the most appropriate for now and others formed out of the choices we make. We now have proof that it takes only 30 seconds to create the beginnings of new neural pathways, with this reality, happiness and joyfulness now become an optional choice and the key to owning this choice is awareness. By developing greater awareness we have this choice to change habitual responses and re- wire our brains to a happier experience of life. I try my best to live with this awareness of choice, sometimes it’s easier than others. I am by nature very sensitive, can be reactive and in spite of 40 years of meditation, still vulnerable to my human hard wiring! The key for me, is in a few little questions – what is really here at this moment, what am I experiencing and what do I want to do? So often, automatic responses are first up, but remembering I have a choice to respond is the greatest gift that mindfulness brings. This applies to the little things as well as the larger ones. My aim with this blog is to share the truth of my efforts to live mindfully, so here goes! Today, I woke up, and in my usual attempt to live what I preach I took a deep breath and began my morning body scan. Having lived for years with chronic back problems, my body scan gives me some idea of how I am, and what I need to do to make that great leap out of bed and into the day. More often than not it’s a slow thoughtful cranking up of my senior bones to standing position! Having been awake in the night with burning sciatica I had a fair idea of what to expect as my spirit leaped enthusiastically out of bed and my body followed a little later. Having successfully creaked my way down the stairs to the kitchen, in anticipation of that first cup of tea,I noticed a stack of greasy roasting pans from dinner last night that we had been too tired to wash up. My enthusiasm for the morning took a little dip and the sciatica in my leg made its presence felt. Mindfulness teaches us to be aware and accepting of things, just as they are. Mmmmm – this was not truly the reality I wanted to engage with this morning. As my leg pain held its place in my awareness and the washing up loomed, the kettle came to the triumphant boil, with the promise of that life – giving cuppa,things were looking brighter. I have a little sweet indulgence in this first cup of tea, in the form of a beautiful spoonful of organic honey. I reached for the pot of nectar, with all it’s therapeutic qualities, but instead of the healing qualities I anticipated, as I lifted the lid, I witnessed a dark, moving mass of surprise – a large family of ants had moved in overnight and found their Nirvana. My immediate thought was to pour the boiling water for my tea into the pot of honey, but as I looked inside they were having such a wonderful time, how could I cast such a catastrophic event on their world! I remembered the film Ant, with all those wonderful characters and all I could see now was a colony of little people having a wonderful party. How could I kill them? My memory then delivered another moment of sentimental anthropomorphism, as I recalled one cold winter’s day when I found one lonely ant making its way across the tiles in the downstairs loo. I can’t bear to see any living thing alone and hungry, so gave it a little spoon of sugar and eventually it went on its way. Job done, or so I thought, until a few months later when I came home to find an army, in fact several armies, marching across my hall into the sitting room, across the carpet to the fireplace and who knows where to their final destination. I had no option but to declare war and this was not the good outcome I had wished for, having saved one lonely ant months previously, I was now destroying hundreds or even thousands. So, what to do with my” honey Spa for ants” this morning? I took a deep breath and asked , what is really here at this moment? A very happy family, having a great party. I picked up the jar and took it to the field and donated the honey to joy! So, back to the present and the day ahead. I quickly dealt with the washing up (forgetting to engage with the bubbles as I did so!) and had a moment of satisfaction to see the space clear and shining again. Next job, to get my hurting bones moving. A float in a deep bath of Epsom Salts and a few drops of Lavender was just the answer – the day was getting better. I stepped out of the bath to wrap a warm, fluffy towel around me but just before I did so, I noticed, out of the corner of my eye, something moving, very, very slowly on the towel. A super wasp was making its way slowly across the fluffy terrain. This would not be a good thing for anyone standing naked and smelling of Lavender but even less of a good thing when you are allergic to the point to Anaphylaxis and your Epipen is in your handbag! Do I stop and ask myself, what is really here at this moment? I don’t think so! Moving slowly towards the door, making my way past this angry, buzzing monster, I successfully closed the door on it and went to cover up and decide its fate. Chasing it around the bathroom with a rolled up magazine would only make it more angry and opening the window to let it out was not an option as the builder had painted it shut! The only option was to catch it in my spider catcher and set it free. Dressed for battle, leggings,socks, hoodie over my head, gloves, not much flesh left exposed to sting and Epipen in my pocket, I went into battle! Poor dozy old thing was still buzzing loudly and crawling slowly up the towel. It was hard to believe this little thing could kill me ! With the super wasp successfully caught in the spider catcher and released into the garden, both of us were still alive and kicking! This day was turning into my own episode of animal rescue. On my way back to the house I noticed Lizzie, my dog, giving something a bit too much attention and went to investigate. A beautiful young thrush had collided with the window and lay, still and perfect, but not breathing ; this one I couldn’t save. I’m generally not very good at dealing with dead animals and my immediate response was to think of who might come and move it for me. I took a deep breath and asked my question, what is really here at this moment? A beautiful, but very dead bird, why the fear? All I needed to do was give it a safe place to rest before becoming breakfast for the cat or fox that hunted regularly in the garden. 30 seconds to do things differently,I picked up the spade and dug a hole, filled it with wind-fallen red Camellia petals and laid the bird to rest, remembering to put heavy stones on top to protect it from foxes, wolves, Yeties or any other monster that may be lurking in the garden this morning. What was that about the human mind gravitating towards the negative? Wow! It wasn’t even 9 0’clock yet and my quiet, simple day in the country had been quite a challenge already. With that thought, Lizzie had placed a blue ball at my feet and reminded me that we should head off to the fields for a walk. I am lucky that I have a large field at the top of our garden that belongs to our neighbour.We are the only people to walk here, and it is fenced, so it is a safe place for Lizzie to romp off the lead. We share many incredible moments here with beautiful skies and I tend to walk with my head in the clouds. The day was feeling better as we shared the freedom and the Spring air. Having got to the middle of the field I bent down to pick up the ball and found it covered in something rather disgusting that took my head out of the clouds pretty quickly. There were never any animals in this field, but this was fresh evidence that we were not alone and whatever it was, IT WAS BIG! I looked up to see a whole herd of enormous, brown cows mindfully focused on Lizzie and me, not too far away in the distance! Cows have been high on my list of fears since being chased by a bull as a girl guide! “Don’t run,take a deep breath and stay calm”- my sensible voice spoke calmly inside my head, but I was already half way up the hill with Lizzie on the lead and my eyes focused on the gate. The fence at the top is very flimsy and any cow could easily walk through it, so I didn’t stop to take a look until I was safely inside the house. I took a breath then and had a little giggle at the fact that I could still run that fast up a hill! Fight or flight is really amazing! I looked out of the window to see a large bush moving dramatically; there was no breeze this morning so something else was causing the dramatic movement. A large brown head appeared through the bush; it had missed me, so was breakfasting on my garden instead! Having alerted the neighbours,who informed the farmer of the escape, I sat down for a moment. What a ridiculous morning and I realised every creature I was having to deal with was getting bigger and bigger – what could be next? In need of a little peace, I decided to go and have a look at the progress in my new meditation studio. This studio has not been without its challenges, having had rabbits eat through the electric cables, and all the newly applied paint peel off the walls and ceiling a couple of weeks ago. I stepped into the bright, light space and put some music on to play. I have just downloaded some lovely piano arrangements by Rick Wakeman. 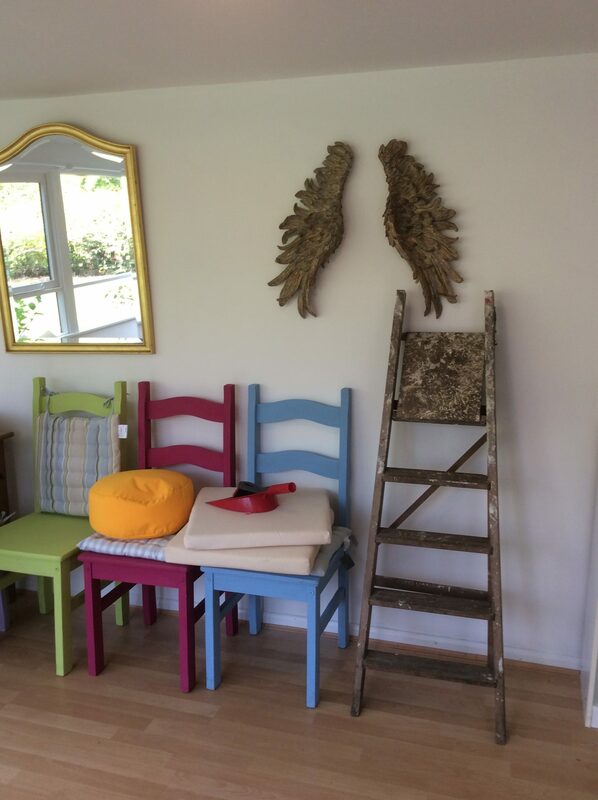 As a gentle melody filled the space and the lyrics flowed into my head, I looked up and noticed a step ladder standing underneath the giant wings on the wall that had been a special gift from my friends – the song playing was Stairway to Heaven! Maybe there was some meaning to this crazy morning! I sat down and embraced the moment and fully indulged in a little stillness and the words of the poet Maitreyabandhu came to mind. ” And whatever else there is, there’s this as well.” Peace at last! There were no more monsters in the house or garden for me, today but part of me is looking forward to getting on a busy train to London tomorrow and some proper stress to embrace! My challenges today were very simple, but some were really life threatening and I hope I may have even put in place the beginning of some new neural pathways!